All that Google gave was leading me to the resources associated with the hakintosh, so I did not even paid an attention to them, because I could not imagine that the genuine Mac (which I currently had) might be connected with Hackintosh. I was wrong – the answer was exactly in Hachintosh. But I did not listen to my intuition and just proceeded investigation which taught me a lot of interesting and useful. For instance, in Mac’s BIOS there is a diagnostic program which you can use to check all of the devices as well as hard drive. 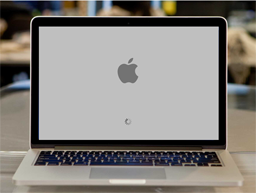 In addition, the hard drive has a recovery partition, it is possible to start the installation of Mac OS from blank list, as well as to run Disk Utility, that lets you scan and heal the file permissions – widespread reason of inability to boot the system. Also, beginning from OS X Lion you can run the Internet Recovery procedure from a boot menu. There is a safe mode (you should hold the Shift key when turning on the computer), I did not understand, what is its essence, but it did not help me – loading system still has not been reaching the completion. Restore worked for me – the system started up, but however, it’s rolled back from Maverick to the original Mountain Lion. a ghost thought has born inside my mind: hackintosh never gone away! The point is that I set up all my Macs after the Hackintosh using Migration Assistant – a standard Mac OS X utility, which transfers data from one computer to another. My journey to the world of Mac began with OS X 10.5 Leopard, and as I said it was hackintosh. One of the distinguishing features of those days was hackintosh kext FakeSMC.kext – it was required to simulate a specific OS X SMC (System Management Controller) which is not presented on Windows based PC. After verifying the relevant directory it’s become clear that this Kext permanently migrated from one Mac to the another and was the reason of many other problems as I can see now. For example, my Macs were unable to physically reboot (soft reset) or shut down the power. I had to hold power button each time and that caused the message ‘the system has been switched off due to emergency’ and offer to send a report to Apple when system launched next time. I even sent a couple of times these reports and asked the question on the support forum – I feel very ashamed today). As a result now all my Macs restart and shut down normally and the update has been successfully installed. P.S. Now I’m definitely going to make backup images more frequently that once per half of year. Папка /Extra не страшна, если загрузчик – родной, маковский, а не Хамелеон. Только Хамелеон оттуда подцепляет кексты. Кстати, про AirPort Time Capsule: мы на работе выбрали NAS от Synology – более гибкие настройки, можно настроить RAID 1. Надо бы заскочить к вам на огонек.